Who Will Oprah Make Up With Next? 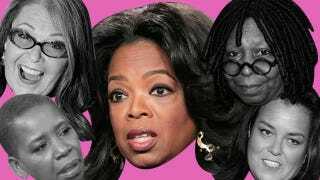 Newsweek points out that a theme of this last season of her show has been Oprah mending fences with famous friends with whom she was feuding, like Roseanne, Whoopi Goldberg, Rosie O'Donnell, and Iyanla Vanzant. Burying hatchets on air seems to play into Oprah's style in that it's at once educational and riveting TV: It serves as a therapy session, teaches lessons on friendship and misunderstandings, while simultaneously garnering big-time ratings. So who's next? My guess is Aretha Franklin. Much like with the other women with whom she's reconciled this season, details of an Oprah/Aretha feud are scant, but the evidence is there. The last time Aretha appeared on Oprah was in 2003, and she hasn't been back since. That wouldn't seem so suspicious, but for the fact that in 2005 Aretha—along with Whoopi Goldberg—was conspicuously absent from Oprah's Legends Ball. The Legends Ball was a three-day celebration honoring 25 African American women that included a luncheon at Oprah's Montecito estate, a ball and a gospel brunch. Although Aretha was an honoree, she didn't show up, supposedly due to a scheduling conflict. Fast-forward to 2011, and Aretha grants her first post "health scare" interview to Wendy Williams instead of Oprah, which reportedly pissed O off. What's more is that during her interview with Wendy, Aretha made a remark that could be viewed as a slam on Oprah when she complimented Wendy on slamming Whitney Houston's 2009 appearance on Oprah for not owning up to her own mistakes. It could be inferred that Aretha was trying to say that Oprah was too soft on Whitney (who happens to be Aretha's goddaughter). At this point, airing whatever dirty laundry she has with Aretha on her show in its final few months could be a ratings sensation for Oprah, but the only problem is that Aretha would have to say yes, and apparently, she might be one of the few in the world who can resist a call from Oprah.